Next Year Is Going To Be So Cool Craftivity is a perfect activity to use to capture their feelings towards this move and build excitement about the next year. 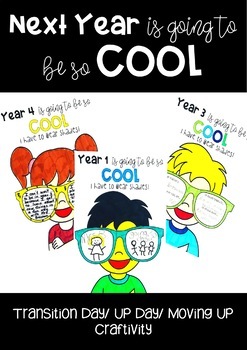 Featuring a boy and girl page for for years one-six with three different sunglasses templates (blank for drawing, lined for writing, sentence prompts, this download caters for the many abilities within a classroom. Simply print, colour, complete the sunglasses template and mount.